I LOVE Brick! Especially inside of a home. Our first home was a simple ranch style home, no bells and whistles. But, it had a brick kitchen. That pretty much did it for me. It was not a cookie cutter kitchen and had the character and charm I desired. It seemed to add warmth to the house. 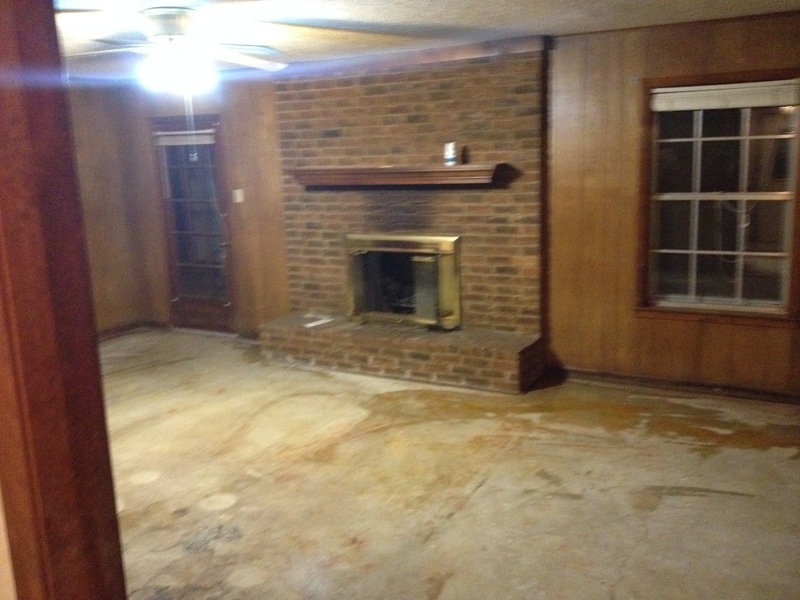 Our dirty diamond home has a lot of brick too; the fireplace and the sun room (which is an add on to the exterior wall). The thing about this brick, kind of “BLAH!” I knew we should do something to the brick but what? 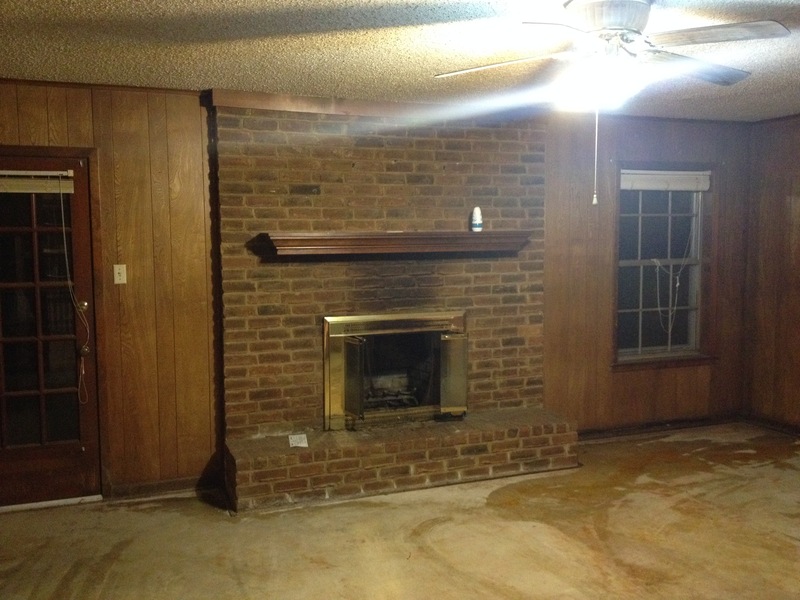 I probably spent several weeks on Pinterest looking at Before and After photos of fireplace makeovers. I kind of had a look I was going for but just couldn’t put it into words. And my poor husband just looked at me with confusion when I would try to tell him what I saw in my head. There were tons of tutorials about “white washing brick.” Y..e..a..h— that is kind of what I’m looking for but still not quite it. 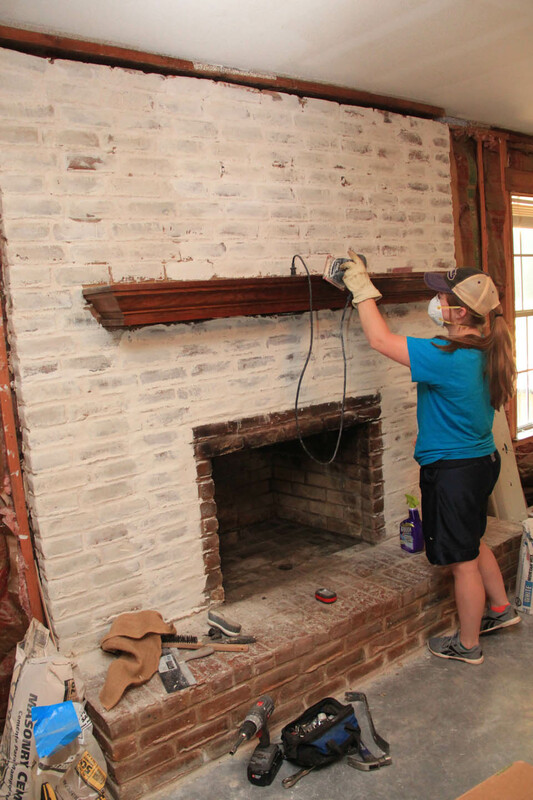 It looked great on some of the fireplaces I saw but I found myself liking the BEFORE pictures with the original fireplace than the finished product. Sound familiar? I finally found an exterior photo of a home with what I was looking for. I read up on it and it was called “BRICK MORTAR Washing.” YES!! That is what I WANT! Now to find some tutorials and look up that term on Pinterest. WHAT?!?! There isn’t anything out there (at least from what I could find). I did find one video tutorial on some masonry website and I think it was for exterior brick. It didn’t go into a whole lot of detail. More just on the technique and what tools to use. So I thought, I’m going to give it a shot. I went to my local hardware store and tried to explain to them what I was going to do. And soon I was surrounded by 3 sales people who were trying to translate to one another what I wanted. Still wasn’t sure if they knew what I wanted, but I trusted them. Turns out they pointed me in the right direction but I still ended up with the wrong color of mortar and 2 bags of unnecessary sand. Don’t ask. I can’t give you specifics on how much to mix. It really is just an “eye ball” it kind of thing. A lot depends on how much brick you are covering. This project took me a couple of days on the sun room. The fireplace in the living room took me a couple of weeks and only because I was so burned out from the sun room wall. 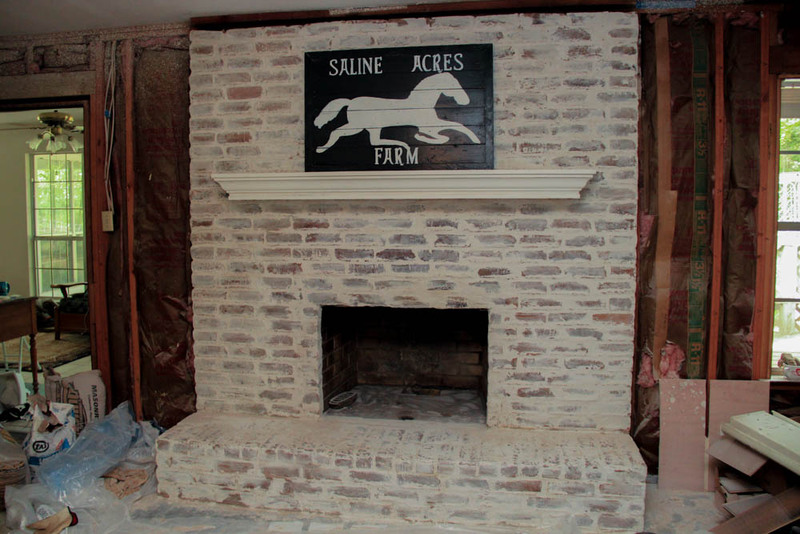 It’s not a difficult project and you could do it in a day if you were doing a fireplace. I was also experiencing what may be carpal tunnel syndrome in my hands and wrists and I needed to take it easy. 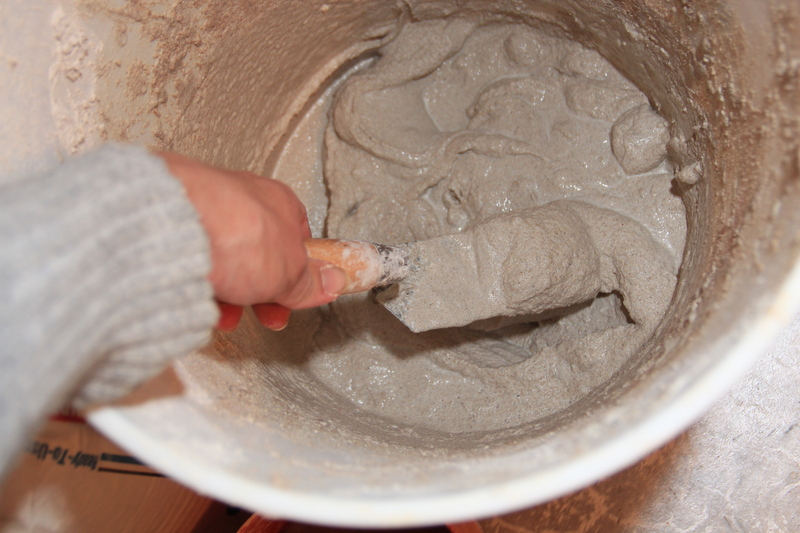 Here’s what I will tell you about mixing the mortar wash.
5. Continue this process on the remaining brick. You will need to continue adding mortar and water to the bucket as you go. If you do too much and you have to take a break for awhile this mortar mix will harden and ruin your bucket. Depending on the size of area you are Brick Mortar Washing you will want to let it set for about 30 minutes to an hour, This is where the Burlap comes in. 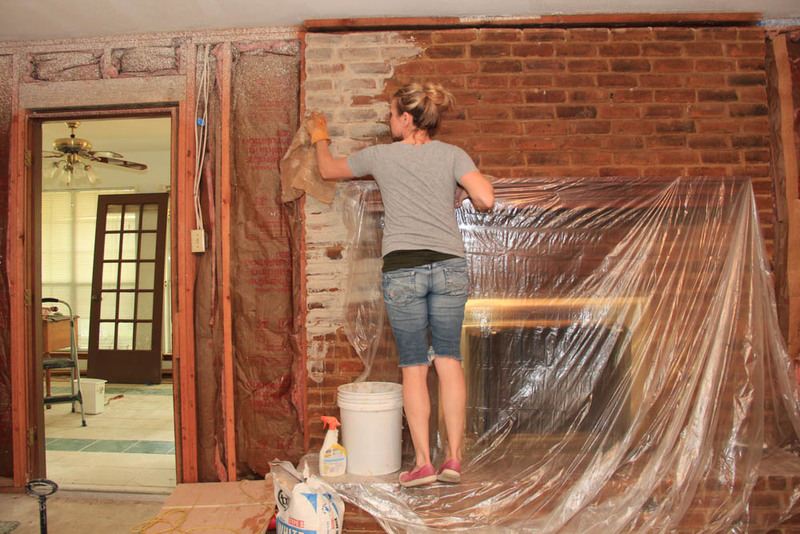 Take Burlap and begin scrubbing the brick. Dust the grit/sand off the brick. I left the mortar grout lines alone. My grout lines were level with the brick. That was the look we were going for. 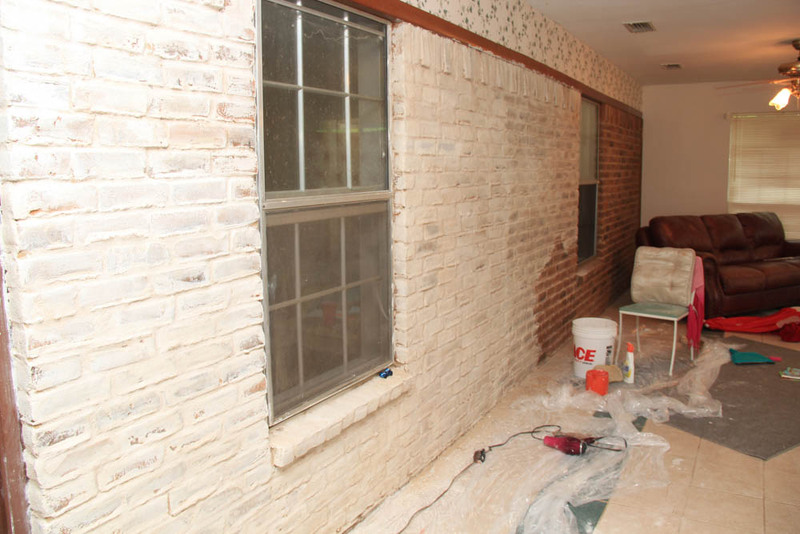 Here is what will happen if you don’t scrub the brick and let the mortar mix dry. Do you see how it has a grittier and heavier look. Some people might like this. 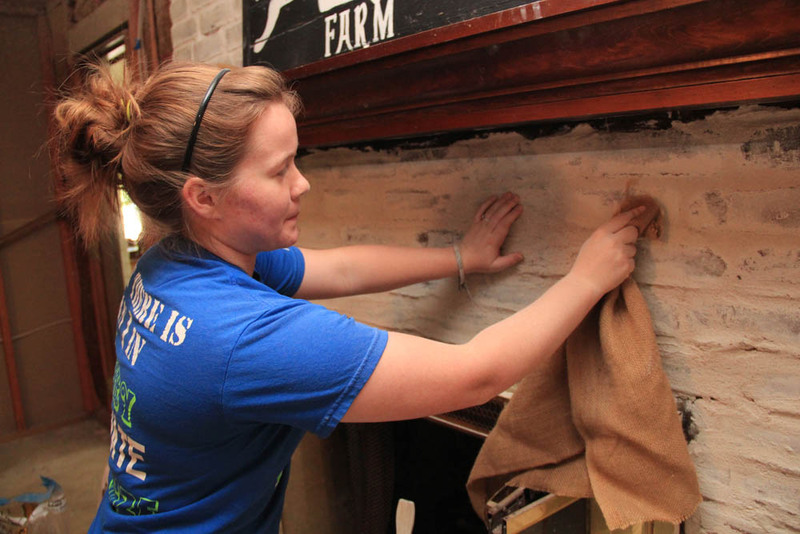 When you use the Burlap and scrub the brick it is smooth. We liked this look. Oh and FYI, Burlap really is the best fabric to use. I tried other fabrics and even a masonry brush to brush off the sand/grit–didn’t work. And that is pretty much it! Super easy and not very expensive. Here is a TON of pictures so you can see how our project turned out. I also did a little video tutorial and you can click here to view. The Sun Room. And yes the wallpaper did come off as well. PHEW!! DONE! Now to rip that wallpaper down, paint the walls and do SOMETHING with this room! This brass fireplace insert was a PAIN to get off. Took three different people trying to get it off and finally my husband who had to man handle it off. I think maybe even a hammer was part of the equation. Finally got that insert off and now cleaning this nasty Ol’ thing! Worthy of wearing the face mask. Our friend and “Renaissance Southpaw Intern” ;>) , Kelsey came to help us finish this project. 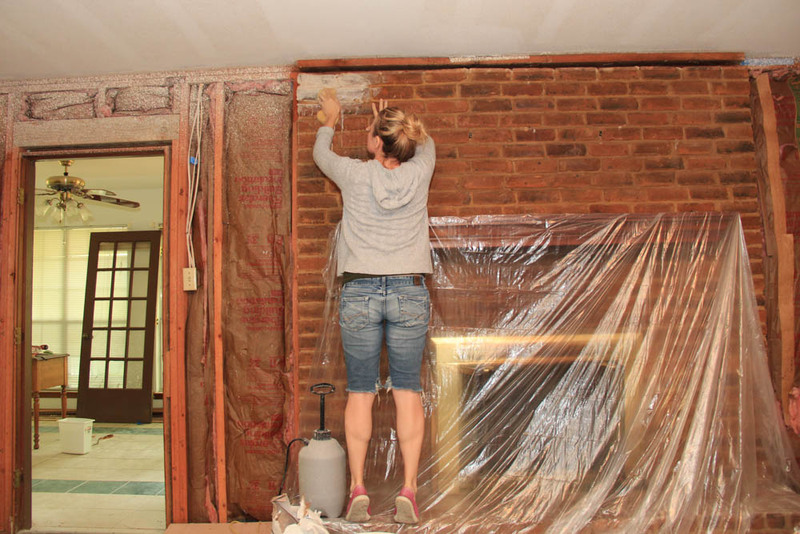 For two days she was a Trooper brick washing and sanding the mantle. First of all, thank you so much for taking the time to do this tutorial bc you’re right I couldn’t find another one out there. This was very helpful! I want to attempt this on the brick on the outside of my house. Do you think I would need to do anything different or should the steps you did be enough? Thank you for commenting and for your question! As far as I can tell this brick mortar wash technique can be used on exterior walls. The mortar is used for laying outdoor bricks so I believe that in this technique it is still very durable, solid, and permanent to all elements. I have some close friends who wish to try this technique on the exterior of their home as well and I’m eager to see how it will look and hope to take some photos and add them to this website. I will say that I still LOVE what this simple technique has done to the look of my fireplace and sunroom! I don’t regret the time I put into it one bit! Plus, everyone who has come into my home, immediately notices the fireplace and appears to love it as much as I do. Good luck if you choose to do this DIY.Be sure to send me a pic of the before and after…I’d love to see it and perhaps put it on the website for those who may be contemplating attempting it. Will do! Thank you so much for responding so quickly! One last question I forgot to ask… I love the color of your mortar bc it looks slightly creamy. What color mortar did you use? I used TXI White Mortar Mix. You can see a picture on the blog post if you want to see what the bag looks like. I bought this bag at Home Depot. I had bought a grey mortar mix originally because the salesperson at our local hardware store recommended to use that color ( grey) based on what I was trying to explain to them. Did NOT like it one bit! THANKFULLY these bags are not that expensive and I went back to Home Depot and we took a chance with the white and it was EXACTLY what I wanted!! Y’all did a beautiful job. My fireplace brick has a low gloss sealer on it. Did yours? I don’t believe our original fireplace brick had a gloss sealer before applying the mortar wash. Not sure if a gloss would have changed the adhesiveness of the mortar. It’s all pretty much trial and error. If you have a small area you could practice on and see how it applies than start small and build as you try the techniques I mentioned above. If it doesn’t stick in that small area…then you can know that it won’t adhere and not have as much clean up. Good luck! Thanks for your comment! Thank you so much for taking the time to write a tutorial. I, too, have been searching for a ‘diy’ way of ‘white washing’ brick without it looking so uniform. I love what you did here. We’re wanting to do a large fireplace but the rest of the room is white shiplap and so we would really like to not make it quite so ‘white’. Using your technique is there a way to allow the red brick to show through a little more but still have some texture? Thank you for your comment! I’m so glad you found it helpful! And the answer to your question is “yes.” Just recently I went and applied this same technique to my sister’s fireplace. She wanted a cleaner look. More the grout being white and keeping the brick exposed more so than mine. 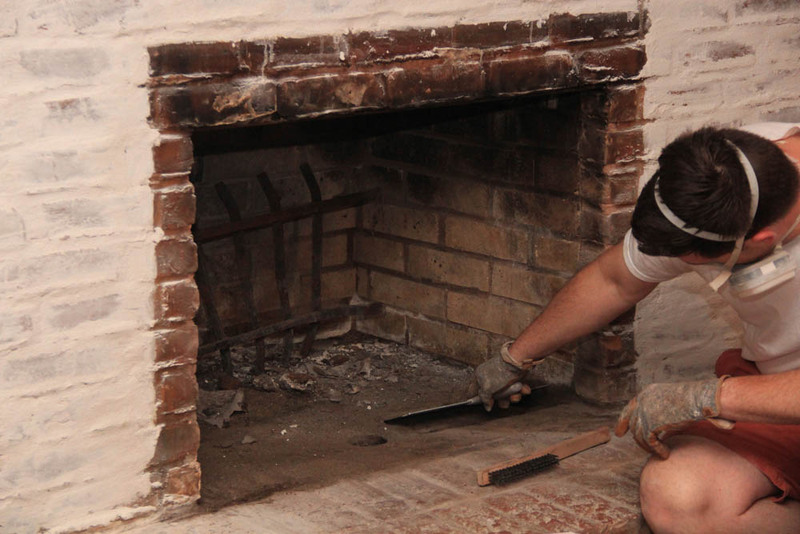 With my own fireplace I applied more of the mortar, filled in the grout lines to be level with the brick and left it on the brick for a longer time before wiping/sanding it down with the burlap. I was planning on uploading my sister’s fireplace very soon to show that you can use the same materials and same technique and get very different looks depending on what you want. My fireplace and her fireplace are very different. 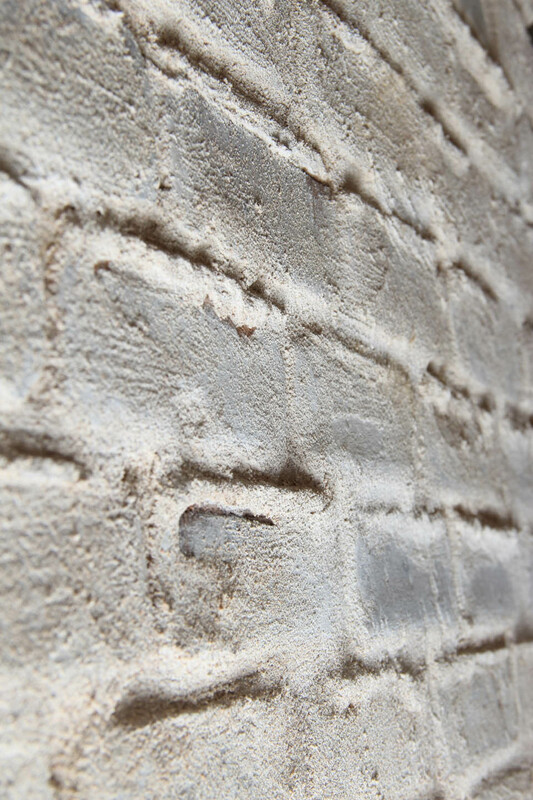 I just found this tutorial on brick mortar washing! Thank you for posting! I have been wondering if I could do something like this in our home. I do not want to get rid of the brick but I feel that the grout/mortar is too dark for my taste so I want to lighten it up. I was starting to think my only option was painting which I was hoping to avoid. 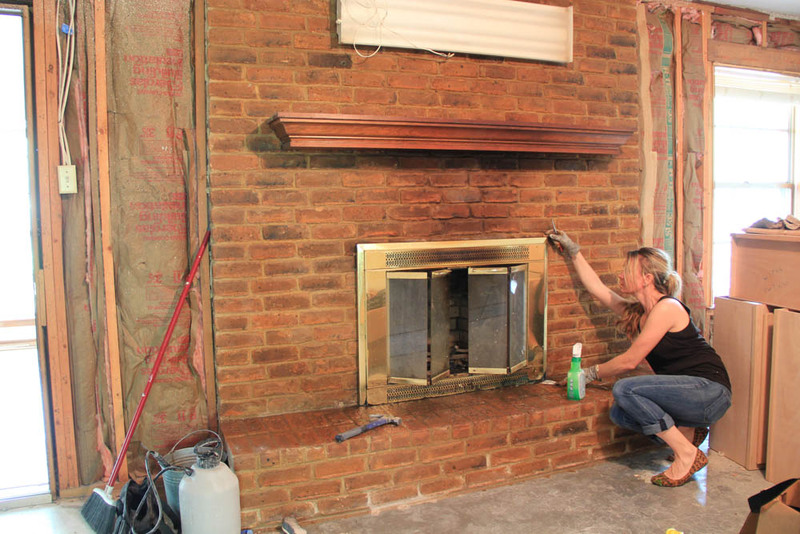 Do you have the pictures of your sister’s fireplace after you brick mortar washed it? 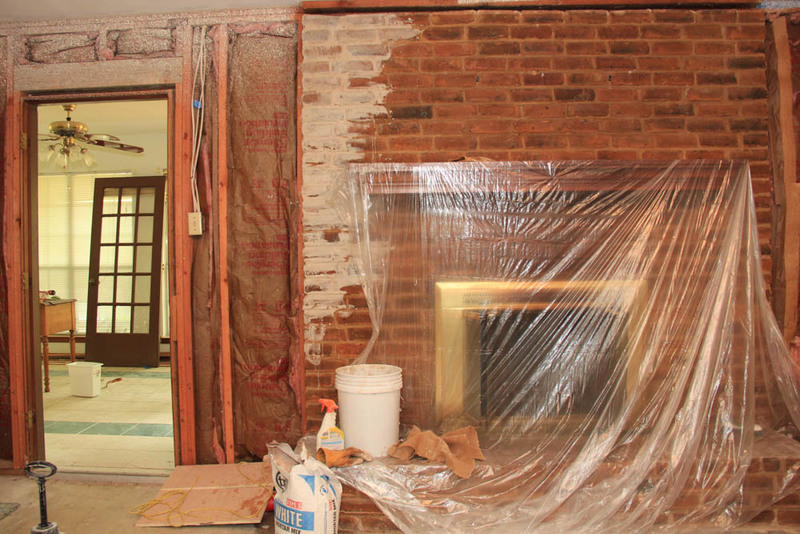 I am interested in making a very thick, white grout/mortar between the bricks and just random areas of white scattered on the brick throughout the brick on the fireplace. Thanks! Lisa, Just posted a new blog post about my sister’s fire place. It is a lighter application so you will see a pretty big difference between her fireplace and mine. great tutorial! thank you so much for posting. 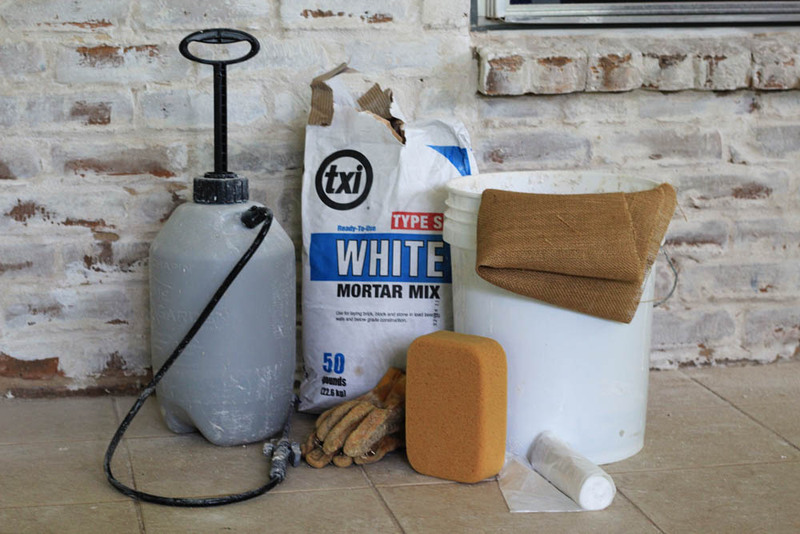 I couldn’t find the brand white mortar you used and am debating whether to find white mortar online (my lowes and home depot did not have white) or use a lime based mortar: http://www.limeworks.us/ecologic-mortar.php. Does your mortar rub off at all once it is dry? did you worry about heat from the fire and the mortar? I really like the mortar look vs painted brick. You did a really great job! Thank you Heather for commenting and your questions. I found the white mortar mix at our local Home Depot. But I know that could probably vary depending on where you live. I checked out the website you listed and it looks very interesting and that the product would achieve the same look. The good thing is that it isn’t super expensive so if it is not the right color or doesn’t do what you want it to, you are not out too much money. Just find what works and apply over it. I noticed you could order two different sizes, 38.5 lb bag or 1 quart for $11. May be worth just buying the quart first. Did you also check local-home town, hardware stores? Love this. Thanks for sharing had a hard time hearing you at the end of the tutorial. Is there another tutorial out there somewhere with better sound at the end lol? Sorry you couldn’t hear it. I haven’t had any one mention that as being a problem. I’ll have to check it. You might want to check it one more time too just in case it was a technical issue on your end. As far as I know, there isn’t another tutorial, that is why I did it. Thank you for stopping by. Ok thanks so much. Will try on my ipad instead. Love your work!! Hope to see you on tv soon!!! Haha!! YOU are too kind. BUT, you made my day! Hello, thank you for posting this. My grandson came over and did my fireplace yesterday. My question is how do you preserve it? Have you had any soot marks on your fireplace? Should I seal it? I did not preserve/seal mine. This is the same quality of mortar you would place on your exterior of your home so it should hold up. As for soot marks, we have not had any, but after time, like most fireplaces, I’m sure it could be an issue. My best advice is just to dust and keep the fireplace clean after so many uses to keep the build up down. After doing this technique, I’m sure if there was soot build up, you could apply a light application of the mortar to lighten it back up. So how do you like your fireplace now?? Hi! I was just wondering how much morter per square foot you would estimate that you used .. ? Thanks! You would ask me a math related question, wouldn’t you? haha! Here is what I can tell you. I used two 50 lb bags to cover three projects: my sunroom (30’x8), my fireplace (7.5′ x 9), and my sister’s fireplace (approx. 5’5′). So used about 335 per sq ft within the two bags. I hope that helps. A LOT depends on the technique of how much or less you want to apply as well. I used a lot more on the sunroom than on my sister’s fireplace. So it’s all in the application. Thanks for commenting!! So is that 3.35 per square foot or 335? Thanks again ! hi! i’m so grateful for this tutorial! i’m trying to get the materials and everything ready for the exterior of our house. BUT our home depot doesn’t have the same white mortar as you used. They have to special order it and it will take 4-6 weeks. I’m actually going to paint my house after, I’m going for the slurried brick look and we are painting it white. Do you think i can use reg mortar? I have a huge brick wall in my home I’m hoping to do this technique on it. LOVE your tutorial. I have a question about brick preparation. Did you clean your brick in any certain way before hand. I’ve been told I need to wash it with muriatic acid first, but don’t want to use that in my home if I don’t have to. Jenny, Forgive me for taking so long to respond :>( I have had to put home improvement tasks and blog posts to the side due to end of the school year activities with my children. Been a crazy several weeks. All I can tell you is what I did and my experience. I did not use the muriatic acid to clean my brick. I dusted it and wiped it down with a damp cloth and that is it. I was terrified of the acid. However, I did need to use it after I applied a little too much mortar in one location and I wanted to “thin” it out to look more uniform with the rest of the fire place. I hope that answers your question. You many have already proceeded with the process without my response. If so, I hope that you are very happy with it. Thank you for your comment and your question. I appreciate it!! this is also called Greman smear. Yes, that is a term that I’m seeing used as well. Thanks for your comment. 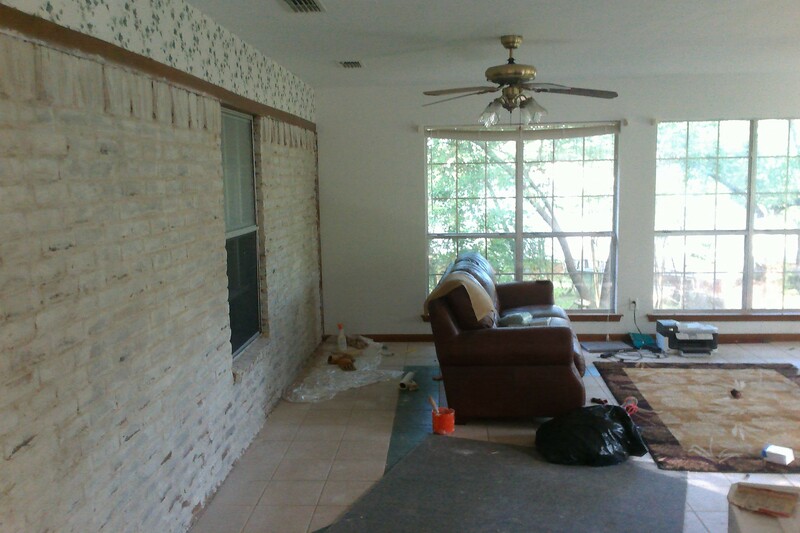 So, I too was intrigued by changing the brick color of a brick facade on either side of a gas stove in my lakehouse. I really didn’t like the color of the brick and had seen this “mortar bleed or washing” on a house I had seen driving around town one day. So, I went searching on the Internet for information. I found your blog and website and found some other sites as well and watched white washing brick video clips as well. I came up with my own “solution” and used thinset mortar that was left over from a floor tile install done several months back. I also purchased another bag at Lowes, but hardly used any of it, as it went a long way. I mixed the solution fairly thin (a little thicker than interior paint) and wiped it on with a large tile sponge, like the one you used. I decided to cut the sponge in half as it was hard to hold without dropping it. That worked much better for me. I let the mortar mix sit on the bricks for about 15 minutes, then took another tile sponge (one that had a scouring pad on one side) and used that side to lightly sponge off part of the mortar. I eventually stopped using then first sponge to wipe on the mortar mix and just used my gloved hand. It was easier to control and place the mortar where I wanted it. I did use the burlap on some bricks when the mortar dried. Later that evening,as the mortar`was fully dry, some of the bricks were a lot whiter than I wanted them. I sprayed vinegar and let it sit, then sanded parts of the bricks to show more brick. It really turned out nice! So glad you had a good experience with it! Don’t you just love it?! Best thing we did to this house (well there’s a lot of great things we’ve done to this house )! 😉 thanks for your comment and telling me about it! You should be incredibly proud of your creativity and hard work! I have done much research on this as I have a very dated 14 ft wall of ugly red brick that I have painted Benjamin Moore Georgian Brick to camouflage it’s man-cave era. It’s long overdue to lighten up our family room. I am inspired so much by your work and I truly appreciate that you took the time to post each step. I am getting my nerve up to DIY possibly the next few days. 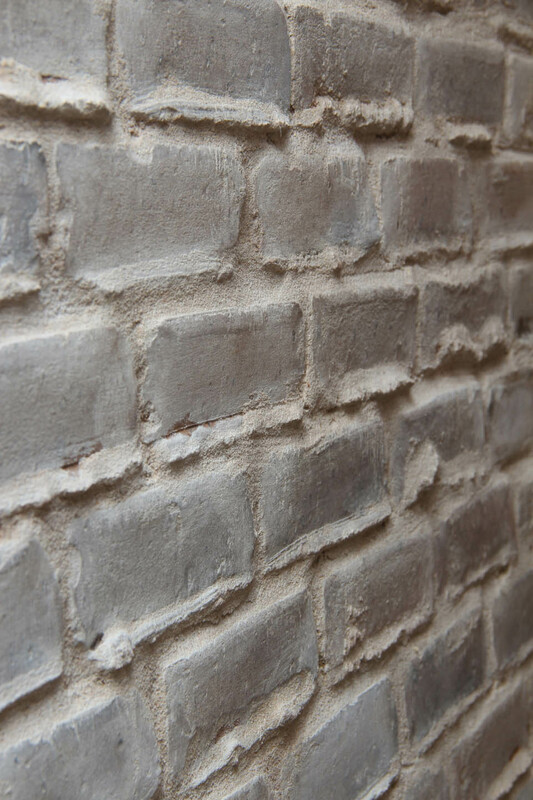 We lightened the walls up with Monroe Bisque and I too like the aged look of distressed bricks and you my girl have made me believe I can do this! What do you think about applying it a little lighter to avoid a lot of sanding? Let me know your thoughts. I will keep you posted with before and after. Yes, you can do it.😊 Thank you for your comments. So glad to be an inspiration. I have applied a lighter mortar to my sister’s fire place. It lightened the brick but didn’t produce the “old world” style. I think it is lost if you do less, I think. You can click here to see my sister’s fireplace. https://renaissancesouthpaw.com/category/living-room/ Good luck! Post your before and after pics. You’ll love it!! mortar mix at Home Depot or Lowes. Finally decided to go to a brickyard and bought the white mortar and the white sand to make our own mix. Spent more time prepping for the dust than actually applying the stuff! Do take care to cover your floors as this is a BIG mess. Have the shop vac on hand. Great advice about the burlap. It was the best way of removing (sanding) the smear and creating the affect we wanted, which was more of a stucco with worn areas. Love the new Old World look. Thanks, again for the post. Yes, the dust can be much. That is why I worked in small increments for fear of the mortar mix drying before I was ready for it to be. When I applied the mortar I was renovating our house so the floors were not as much of concern since we would be redoing floors. However, if the mortar falls onto the floor and is not addressed it will harden and be hard to remove. So yes, please cover the floor with plastic or paper. Thanks for your comment and positive outcome. So glad that your project turned out so great!! How did you get rid of the popcorn ceilling? My husband took a spray bottle full of water, sprayed/soaked the popcorn on the ceiling for probably 3-5 minutes prior to the scraping. He was on a ladder and used a approximately 12″ mudding knife to scrape the popcorn off. It was a messy job. Thankfully, we had removed yucky carpet and laid plastic down to catch drippage and popcorn. This was all done before we intalled new carpet and wood flooring. Once scraped, we hired some help to spray a light orange peel texture on ceiling. Then we painted the ceiling. Looks great and up to date! What is the name of the paint color you used to paint your paneling? It is Sherwin Williams, Accessible Beige, trim is SW Alabaster. LOVE LOVE these colors! Where did you get the sign? Are you asking about the Horse Sign? :>) My husband put the boards together and I painted it.